Earn up to 30 Vaportiser Loyalty Points. 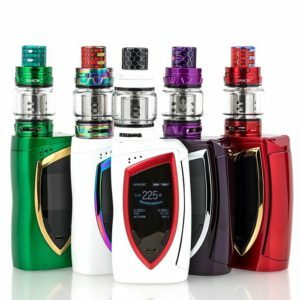 The SMOK Devilkin 225W TC Starter KIt exemplifies the design prowess of SMOKTech, developing a visually stunning vape device with 1.3″ HD OLED display to pair with the industry-leading TFV12 Prince Sub-Ohm Tank. The SMOK Devilkin 225W Box Mod integrates a beautiful “blade” edge surrounding the OLED screen with colorful high-quality resolutions on the front-end. The entire visual masterpiece combines luxurious yet powerful experience, while small details such as stealth lateral firing bar and creatively placed adjustments buttons provides ergonomic support. The internal chipset can fire up to an impressive 225W, along with comprehensive temperature control suite that packs in adjustable TCR as well as preheat capability and Memory Mode. Each kit comes with the most popular tank of 2018 so far, the SMOK TFV12 Prince features a maximum capacity of 8 milliliters, button-lock hinged top-fill, smooth dual bottom airflow control, and the versatile TFV12 Prince Coil System. A truly phenomenal balance of high-performance and exquisite designs, the SMOK Devilkin 225W TC and TFV12 Prince is set to enter the market with spectacular fashion.